Netflix celebrated the new year by announcing the premiere date of Stranger Things season three. Season one premiered on July 15, 2016 with an episode titled “The Vanishing of Will Byers.” Season two followed on October 27, 2017 and had a Halloween theme. The streaming service will debut season three of Stranger Things on July 4, 2019. Netflix’s critically acclaimed, award-winning series was created by writers Matt Duffer and Ross Duffer. The cast of season two included Winona Ryder as Joyce Byers, David Harbour (the new Hellboy) as Chief Jim Hopper, Finn Wolfhard as Mike Wheeler, Noah Schnapp as Will Byers, Millie Bobby Brown as Eleven, Caleb McLaughlin as Lucas Sinclair, and Gaten Matarazzo as Dustin Henderson. Cara Buono is Karen Wheeler, Natalia Dyer is Nancy Wheeler, Charlie Heaton is Jonathan Byers, Joe Keery is Steve Harrington, Dacre Montgomery is Billy, and Sadie Sink is Max in the sci-fi action/comedy/drama. Princess Bride‘s Cary Elwes will take on the role of Mayor Kline in the show’s much-anticipated third season. The streaming service also confirmed Jake Busey is on board as a guest performer in the upcoming season. Busey will be playing a new character named Bruce. 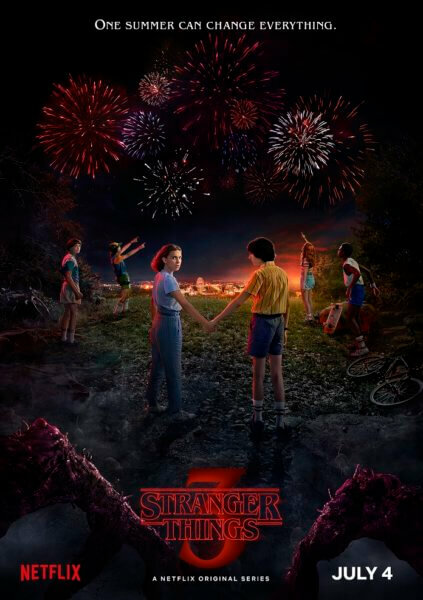 Stranger Things: A love letter to the ’80s classics that captivated a generation, Stranger Things is set in 1983 Indiana, where a young boy vanishes into thin air. As friends, family and local police search for answers, they are drawn into an extraordinary mystery involving top-secret government experiments, terrifying supernatural forces and one very strange little girl. Stranger Things 2: It’s 1984 and the citizens of Hawkins, Indiana are still reeling from the horrors of the Demogorgon and the secrets of Hawkins Lab. Will Byers has been rescued from the Upside Down but a bigger, sinister entity still threatens those who survived.